Dennis Sarabi, MD, PhD, FACC is a cardiologist in Newport Beach serving patients throughout Southern California. He is internationally respected among medical specialists for his advanced training and skills in cardiac care. 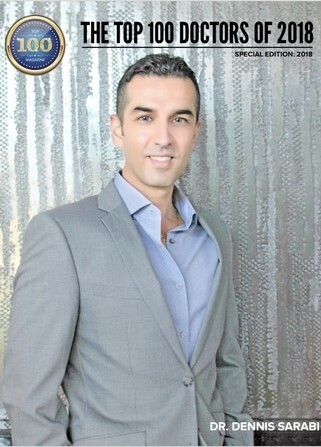 With board certification in Cardiovascular Diseases, Nuclear Cardiology, Echocardiography, Cardiac Computed Tomography, Cardiac MRI and Internal Medicine, Dr. Sarabi is highly experienced in cardiac treatment. As a frequent speaker and strong advocate for heart health, he educates communities on topics such as diet, exercise and the role of cardiac imaging in prevention and treatment of heart disease. "We are entering a new and exciting era of cardiac imaging which will dramatically change the way we practice cardiology today, " says Dr. Sarabi. "I am committed to remaining on the forefront of new technologies and treatments." Contact us online or call 949-706-1114 to schedule your appointment with Dr. Sarabi. Dr. Sarabi specializes in the prevention, diagnosis and treatment of a wide range of conditions including coronary artery disease, arrhythmias, heart failure and heart valve abnormalities. His clinical subspecialty is in preventive cardiology as well as advanced cardiac imaging with a focus on Cardiac CTA, Cardiac MRI, Nuclear Cardiology, and Echocardiography, as well as Aggressive and Scientific Primary and Secondary Risk Factor Management. Dr. Sarabi holds a PhD degree in Cardiovascular Medicine, based on extensive research on how cardiovascular risk factors affect vascular function and atherosclerosis. He has authored over 30 scientific manuscripts in his areas of speciality, all of which have been published in prominent national and international medical journals. 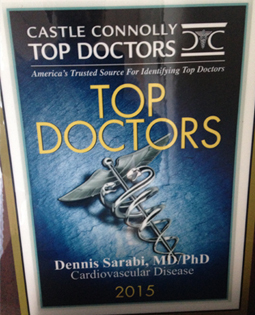 Dr. Sarabi completed his residency in internal medicine and a fellowship in cardiology at Albert Einstein Medical Center in Philadelphia, Pennsylvania. This residency was followed by a fellowship in cardiac CT and MRI at Advanced Cardiac Imaging Center in New York, New York. Dr. Sarabi was a previous post-doctoral fellow at the National Heart, Lung & Blood Institute of the National Institute of Health (NIH) in Bethesda, Maryland. Prior to moving to Newport Beach, California he was the Director of Cardiac CT and MRI at Albert Einstein Medical Center. Currently, Dr. Sarabi is a physician advisor and acting director of advanced cardiac imaging and an active member of the board of medical directors for the Heart and Vascular Institute at Hoag Memorial Hospital in Newport Beach. He looks forward to providing world class cardiac care from his state of the art office location in Southern California for many years to come. Cardiovascular Risk Factors and Endothelium Dependent Vasodilation. ACTA UNIVERSITATIS UPSALIENSIS, UPPSALA 1999;821. On Amazon.com. The types of circulating fatty acids influence vascular reactivity.Lind L, Sodergren E, Gustafsson IB, Millgard J, Sarabi M, Vessby B. Lipids. 2002 Dec;37(12):1141-5. Soluble intercellular adhesion molecule-1 is related to endothelial vasodilatory function in healthy individuals.Holmlund A, Hulthe J, Millgard J, Sarabi M, Kahan T, Lind L. Atherosclerosis. 2002 Dec;165(2):271-6. Cardiac and vascular structure and function are related to lipid peroxidation and metabolism.Steer P, Millgard J, Sarabi DM, Basu S, Vessby B, Kahan T, Edner M, Lind L. Lipids. 2002 Mar;37(3):231-6. Endothelium-dependent vasodilation is related to the fatty acid composition of serum lipids in healthy subjects.Sarabi M, Vessby B, Millgard J, Lind L. Atherosclerosis. 2001 Jun;156(2):349-55. Mental stress opposes endothelium-dependent vasodilation in young healthy individuals.Sarabi M, Lind L. Vasc Med. 2001;6(1):3-7. Short-term effects of smoking and nicotine chewing gum on endotheliumdependent vasodilation in young healthy habitual smokers.Sarabi M, Lind L. J Cardiovasc Pharmacol. 2000 Mar;35(3):451-6. Relationships between endothelium-dependent vasodilation, serum vitamin E and plasma isoprostane 8-iso-PGF(2alpha) levels in healthy subjects.Sarabi M, Vessby B, Basu S, Millg inverted question markard J, Lind L. J Vasc Res. 1999 Nov-Dec;36(6): 486-91. Effects of age, gender and metabolic factors on endothelium-dependent vasodilation: a population-based study.Sarabi M, Millgard J, Lind L. J Intern Med. 1999 Sep;246(3):265-74.